Heck, That brings back nice memories. As a 12 year old in the 1970's, she had visited a bookshop on the left bank, the rue de la Bûcherie, in Paris called Shakespeare and Company "I remember" she explained in English, in that wonderful accent, "A charming young man with eyes that pierced my soul, slim, dressed in black, and a voice to die for". Errrrr, umm, "He had a French name, but he was English" Uh. Oh dear. "His French was rubbish, but as a little girl, I decided, this is the man I'm going to marry" Oh my. "It was but a child thing. But I remember with great fondness"
"It was you, wasn't it." Probably. It was wonderful. Hard, hard work, but wonderful. No pay. There were lots and lots of bunk beds. And the most gorgeous stew that steamed up the windows. We lived, ate and slept there, and I'd do it again given the chance. The range of books was amazing. I can't describe adequately what a wonderful and life changing experience it was to spend time there. I met a lot of people from all over the world, made lots of friends. It's one of the happiest times of my life. George died last year, in his 90'. 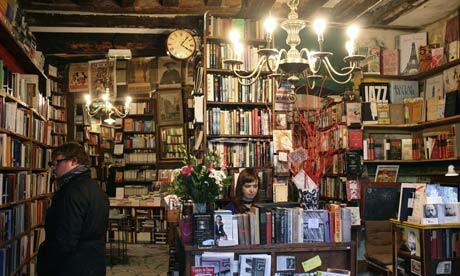 If you are ever in Paris, I recommend a visit at 37 rue de la Bûcherie, in the 5th arrondissement. The Beard is coming on well. I went on, as they say on twitter, a #deathwalk with Bear to a local shop. I waited outside with Sigma The Dog, and was deeply amused as people stared as they walked past Siggy and I into the shop. A quick Barry White "Ho, Ho?" made 'em smile. I had an odd experience last night. Actually it's a repeat of something from a very few years back. Then, I was sat on my computer one night. I keep the door open so I can see down the hall to the front door. My stairs lead into the hallway. I looked up and there was a young dark haired girl sat on the bottom of the stairs, maybe 10 years old with her chin on her hands looking really sad. Then, I got up to talk to her, thinking it was a mate of my daughter. She turned to look at me, and simply faded away. Naturally, I thought I'd lost my marbles and had a word with my doc, who said as long as it didn't happen too often, I was fine. A few days later, the very same young lass walked past. "Hey!" she said. "I used to live in your place. I loved it there. I miss it"
Last night was a carbon copy. It was the same girl, same age, maybe later on, 3 am ish. But here's the catch. She should be a few years older now. No she wasn't. It's all very odd. Here in Yorkshire, it's called Brawn. In France, cooked in white wine and set in little jelly moulds, it's called Fromage de Téte or Fromage de Téte Porc. 'Pork cheese head'. No cheese involved, because the French language often uses colourful descriptions of food. Sounds posh and classy to us. A Frenchman knows exactly what he's getting, because they speak French, ladies and gentlemen. That's why they make fun of us. French sounds romantic only to the English. Trust me, I know, a Yorkshireman suffering a forename like mine, mes amis. Anyway, I'll stick with Brawn. I was lucky enough as a kid to have shared a back yard with a butchers, Wateralls, and putting aside I use to drop Lifeboy soap in his dripping pot for a laugh, I use to do his ledgers and earn a bit of pocket money helping out around the shop, and learned quite a lot about turning meat into profit. Brawn is pigs head boiled for hours and hours with whatever herbs and spices you can get your hands on. Forget any recipes you might find on the web about 'simmer for four hours'. It takes as long as it takes. I start it on the hob and put it on a slow cook setting in the oven. The resulting meat is fished out, chopped up, put in a mould (a loaf tin or two will do) topped up with a little of the liquid and left to set for 12 hours. Sliced, it's delicious. Yes it sets. That's gelatine, and was originally used to make sweet jellies too. How can you tell I'm into very ancient recipes? You may wonder what happens if you put Lifeboy soap in a dripping pot? Science in action. Lard is clarified fat. Dripping is fat that has dripped from roasted meat. Old time butchers used to 'cheat'. They'd roast their meats, save off the resulting fats and boil it down with any left over bits of meat and fat they had left over in an absolute massive pot. Once reduced, it would be strained set and sold. Soap is made using palm oil nowadays, and it's little more than a fat, a catalyst, and smelly stuff. The chemistry is simple, and thousands of years old. The combo produces molecules that love water, and others that love fats and oils. Any oils and fats are attracted and pulled away with anything, like dirt, stuck to them. Usually, If I have electrical repairs to do, I do them very early morning or late at night when the house is quiet. The mantra I'm always banging on to the Wheelie Manor Mob is 'Tidy is good. Tidy is cool. If you leave it out, some bugger will borrow it or eat it. And get those knickers off that radiator". So what did I do? Middle of the day, mob was out for a while, I thought Ooh. Me time. Out came the soldering iron and multimeter, On went the Science Channel. Should have known better. Darn it. Forgot to lock the door. "'Ullo mate. Noticed your lot went out, thought I just see how you are. I'll make myself a cuppa. What you doing?" Normally, I would have thought, aw, bless. What I was actually thinking, sat there with a very hot soldering iron poised menacingly in my hand and a string of solder between my teeth, is probably painful, illegal, would require some co-operation on their part and unprintable. "Oho" he said, a bloody great pint mug of tea in his hand. "Mate, you hide your light under a bushel. Didn't know you did stuff like that....". Too right they didn't. Now the word is out. Now it's "Oh, Wheelie, I was just passing, and I wondered if.... and they wanted to charge 40 quid at (insert distant repair shop here) and I'm sure its only a little thing....". £40 is cheap. Look at it this way. The maths work out something like this. Vat is 20%. £40 becomes £32. Parts and postage on something small - say a toaster? Maybe £10. Hours of work is always rounded up. Lets call that an hour of testing, checking, cleaning, fitting, skills and labour, minimum of £20. Profit? £2. Aha, you say. That £20 labour is profit? Nope. Has to go to one side to ensure the capital is available for the parts and postage for the next repair, and the tax man needs to know about it all. They're actually looking for a freebie. 'Cos I'm a nice guy. No I'm not. Sigh. Just buy a new Toaster/Power supply/Million candle power torch/Graphics card, ect. willya? I like to do the Santa bit, if only a little. Just need the moth eaten reds and sack'o'stuff. Don't need the make up or false beard or anything. Policeman doing a door to door about a local burglary. He thought perhaps they may have crossed my garden when they escaped. Naw. My zoo would ravage 'em. Then he blinked and stared. "You wouldn't be doing the Santa bit this year?" Thinking of it, I said. "Umm" he said, looking a bit embarrassed "Have you done your CRB (Criminal Records Bureau) check?" No, I explained. Never felt the need because I'm not employed to do it. It's a friends thing. "Perhaps you should, though it's a bit late now. Takes a couple of months....?" Their all my friends y'know. If Santa wasn't, what would be the sense in it? For non Brits, a criminal records bureau check is required for anyone who works, either employed or voluntary with under 18's or vulnerable adults. For every work you may do you need to reapply. It can get quite expensive, and every time it can take, as the chap said, at least a couple of months. There are two levels of check, depending on the job. SANTA needs a CRB check !? Bloody heck. Did you ever see Father Christmas young man? (I had to sneak the 'young man' thing in). "No" he said smiling "No, I never did" Never out of the corner of your eye? Heard a door shut quietly? How about sneaking downstairs and waiting? Did you ever stay awake to see him? Hide behind a lit up Christmas tree? "Yeh" he said smiling. "Yeh, I did. Night mate" He shook my hand and walked away. I use my webcam quite a lot. As a visitor said not long back, "It's a lifeline isn't it?" I suppose it it is. It's also allowed me to chat with people from different cultures. For instance, I've had a lovely conversation with an older, gentle Japanese businessman. "Dray" he asked "Can you show me your hands?" Puzzled, I did. He chuckled. "By gum" he said, in a really bad Yorkshire accent. "Grow those little finger nails mate" Apparently, a long little fingernail on the right hand is a sign of status among the older generation, the theory being that someone who hasn't done manual labour would have unbroken nails. The Japanese have a very strong work ethic, and a strong sense of class structure. Unlike the British class system of people having a vague sense of their place, the Japanese strive to overcome their place in the pecking order and throw themselves into copying their Elders to attain that they believe is status. That may sound silly to a Brit or a Merkin, but the the elder Japanese population are living longer, and they far outnumber the young 'uns, so their traditions are surviving. I've set up a little webpage using my video camera using Yawcam and No-ip so that when the family, and a few friends know I'm on my own so they can check on me while their out through their computers or mobiles. I dunno what they think I'm going to do. Most boring video feed ever. Oh, look. A cat? But seriously, that combo of services, both free, would be cool if you are a weather watcher, monitor an aviary, a nest, home security, wherever your imagination takes you. Now y'see, this winds me up. I've been told that I'm having what I'm told to eat or go without. Look at that profile picture. Do I look like a bolshy but talented three year old who won't eat their greens? I would have let it pass but I was amazed when I pulled them up on it to find they couldn't see anything wrong with saying that. I got a rambling discourse on how that's what their cooking and that's what 'every else' (whoever they are) is having and........ I said I'll do my own. That got'em. I'm not a yeller or shouter. I'm a grit my teeth Mr. Reasonable with a calm cool and collected Barry White voice. Flying off the handle is not my thing. I've negotiated with ministers and diplomats, 'civil' servants and once got an apology out of a certain Mr. Scargill. Now that pushes civility to the limit :) I was gifted with The Voice and I unashamedly know how to use it. In case you're wondering, I was told quite casually out of the blue as if it was quite a normal thing to say. I kinda hoped there was some misunderstanding. Nope. What's my problem? My problem is that the difference between care and control is a very, very thin line. That's a new one. Someone has just phoned and explained very calmly that because I'm better off than they are, I have 'a duty' to help them out. Hoooo kay. That made me smile. I decided to take the bait, as they'd obviously given it some thought. I glanced down at the caller display. Hmmm :) What, I asked, makes them think I'm better off than them? "You have a Blue Badge, right?" Ah. I know where this is going. No. Don't drive. Not allowed to. "But you can use your badge if being driven by a friend or relative". If I had one, yes. But I don't. Not that I owe you an explanation, I said. "I've seen you walk to the shop with Bear" Thar'y'go, Cut to the chase, I said. "If you can go out, well, y'know....."
Perhaps I should explain here that when someone gets a disability benefit it's not 'free' cash. It's someone who has been through the mill of being medically assessed under whatever government guidelines and often much, much beyond those guidelines as needing help to be on the level playing field as the rest of humanity. It's that simple. In practice, that may mean having the cash to pay for carers to accompany you, a carer having to interrupt their lives to help, paying for private care, disability aids, help in getting work, exercising their considerable skills, help with travel. Doing all those things people take for granted. My disability benefits aren't means tested. That means any benefits are not affected by my income because the benefits enable me to have an income. I'd be a greater burden on the state unless I was enabled to have an income. It does not mean stuck in, waiting to die like a bloomin' sprout. I am 'allowed' out. I am 'allowed' to have someone with me. I am 'allowed' to have a life. Glanced at the caller display again So, I asked, your point is? They paused that second too long. Mobile? I said. Nice. Get a good deal? "Yeah, £25 a month, 500 meg dahh...?" Let me guess. Direct debit I said? without pausing for breath. Overdrawn? That's a pain. Who are you with? How much have they charged you? I can arrange a food parcel for you if you want? You're phoning a land line from a mobile? That's expensive.Who gave you that? Give me your log in details and maybe I can sort it for you. I have your phone number? They haven't cut you off? You have a problem with me being out? Do what you have to do. And yup, I get what what they were trying to do. Annoying, but not a problem. Sort of. The Beard is coming along fine. I had been worried I had left it a little late this year. The Beard? I've only a couple of days without it since I was old enough to grow one. When one of my brothers called and asked me, quite seriously, whether I was in, and The Bear kept looking at me sideways and shaking her head, back it came. Usually, it's a neatly trimmed goatee and moustache. Despite popular misconceptions, beards are high maintenance. Around here, if I had it shaped by a barber it would cost me £18 a time because they can be really fiddly to shape. I'd have to have it done every couple of days max too. But normally, come the end of August, I go full face - like that profile pic up there, but more. You'd perhaps imagine that would be easier? Oh no. I have to stop the darn thing crawling up to my eyebrows and down my chest. Why bother? Ye small gods gifted me a pure snow white beard, and I don't want to frighten the good boys and girls. (Not that the Elf and Equality bods would let me exclude anyone) It's that time of year isn't it? Time to get the elves into gear, dig out my favourite wide black belt, Red Suit and stardust, I love it. I've bartered three pigs heads, that I'll turn into brawn. In a nutshell, a head will be halved and boiled with herbs, spices and peppercorns. Salt will be added later, as adding salt in cooking will toughen the meat. Any meat left on the bone (well, skull) is picked off into a bowl. The fluid in the pan is filtered through a clean cloth onto the meat.Not a cloth that's been through a washing machine. Modern washing powders are full of conditioners and smelly stuff you don't want in food. I found it helps to put the fluid into a pan and simmer it until it's very reduced. Plonk the lot in a bowl and put a saucer on top and something heavy, leave in a cool place overnight. You'll have to experiment with any herbs and spices to get the flavour you want, which can be done at the reducing stage. You'll be left with a meaty, jellyfied chunk of meaty goodness that can be sliced. That fluid, much reduced is gelatin. You'll find in posh restaurants, that's what you are getting. If cooked without salt, herbs and spices, but with added fruit and sugar, you have a classic Jelly. It's great with stale homemade bread and fruit for a 'summer pudding'.